The all-new PROSTAFF P3 riflescope series was designed to deliver Nikon’s legendary optical performance and mechanical consistency over a lifetime of tough hunting use. Built on an all-new, aluminum one-inch tube platform for enhanced durability and modern looks, PROSTAFF P3 models feature a one-inch main body tube and a 3x zoom ratio. The versatile magnification range results in an ideal balance of compact size, wide field of view at the low end and increased detail at the high end. The new PROSTAFF P3 line offers models with the popular BDC, Mildot or Nikoplex reticles. 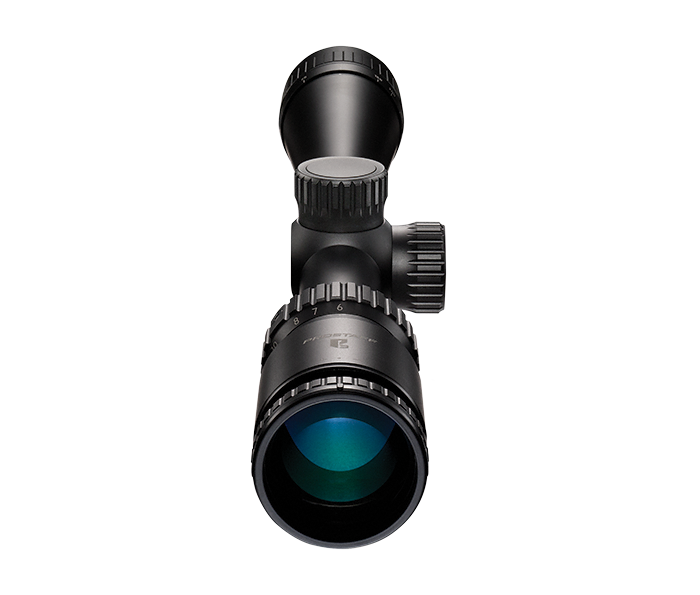 The Mildot reticle features a 1 Mil dot spacing on the crosshair for ranging. All Nikon reticles can be optimized for any caliber or load with Spot On Ballistic Match Technology. Precise, positive-click ¼-MOA reticle adjustments to get you zeroed quickly and maintain your setting, even with heavy recoil. PROSTAFF P3 also features aluminum construction for enhanced durability. Turret caps, zoom ring and eyepiece focus share ergonomic knurling design. Spot On allows you to discover all of the exact aiming points on the BDC reticle at various yardages for your specific caliber, ammunition and load.